Gothenburg ( Swedish: Göteborg ) /jœte'bɔrj/) is a city and municipality in the province Västergötland on the west-coast of Sweden. As of 2005, the population amounted to 487,000 in the actual city and 879,000 in the metropolitan area making it the second largest city in Sweden, after Stockholm. Gothenburg is the largest university city in Scandinavia with some 60,000 students. The city is situated where the Göta Älv discharges into the Kattegat; the River divides the city in two halves: the upper part located on the island Hisingen. 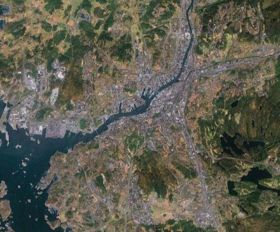 The inlet of Göta Älv is well suited for a harbour, and Gothenburg has expanded its port into becoming the largest among the Nordic countries. The city was named after the Geats (Swedish: Götar), an old tribe of southern Sweden, which today is famous from Beowulf in the English-speaking world. In Dutch, Scots, German and English- languages with a long history of being spoken in the trade and maritime-oriented city - the name Gothenburg (with varying pronunciations) was traditionally used for the city, while the French form of the city name is Gothembourg. These traditional forms are now sometimes replaced with the use of the Swedish form Göteborg, lit. Castle of Geats. Gothenburg's location around 1600. (Denmark yellow, Norway brown). 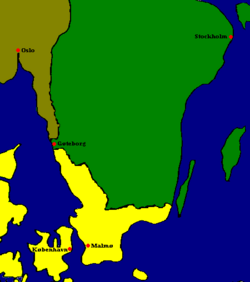 In the 16th and 17th century, the configuration of Sweden's borders made Gothenburg strategically important as the Swedish gateway to the west, lying on the west coast in the narrow area between the territories of Denmark-Norway. After several failed attempts, Gothenburg was successfully founded in 1621, by King Gustavus Adolphus (Gustaf II Adolf). The Gothenburg coat of arms was based on the lion of the coat of arms of Sweden, symbolically holding a shield with the national emblem, the Three Crowns, to defend against its enemies. In the Treaty of Roskilde ( 1658) Denmark-Norway ceded the then Danish province Halland, to the south, and the Norwegian province of Bohus County or Bohuslän to the north, leaving Gothenburg in a less exposed position. Gothenburg was able to grow into an important port and trade centre on the west coast. The architectural layout was designed by Dutch town planners contracted by the Swedish king; the blueprint for the canals of Gothenburg are actually the same as those used for Jakarta. The harbour developed into Sweden's main harbour for trade towards the west and with the Swedish emigration to North America increasing, Gothenburg became Sweden's main point of departure. The impact of Gothenburg as a main port of embarkation for Swedish emigrants is reflected by Gothenburg, Nebraska a small Swedish settlement in the United States. With the 19th century, Gothenburg evolved into a modern industrial city that continued on into the 20th century. The population increased ten-fold in the century, from 13,000 (1800) to 130,000 (1900). In the 20th century major companies that developed were SKF (est. 1907) and Volvo (est. 1926). In more recent years however, the industrial section has faced a recession, which has spurred the development of new sectors such as increased merchandising and cultural and educational institutions. The municipality is subdivided into 21 boroughs, which carry responsibility for primary school, social, leisure, and cultural services within their respective areas. In the election of 1998 three boroughs -- Askim, Torslanda and Älvsborg -- held local referenda on forming their own municipalities, but their petitions were rejected by the Government of Sweden. The legislative body of Gothenburg is the City Council with 81 members elected by proportional representation for a four-year term. It is led by the Lord Mayor (borgmästare), currently Jörgen Linder. The council appoints the The City Executive Board, headed by the mayor. Currently, the mayor of Gothenburg is Göran Johansson, from the Social Democratic Party. Deputy mayor and leader of opposition is Jan Hallberg. 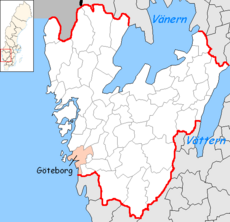 The Gothenburg Metropolitan Area extends to the municipalities of Ale, Härryda, Kungälv, Lerum, Mölndal, Partille, Stenungsund, Tjörn, Öckerö in Västra Götaland County and Kungsbacka in Halland County. 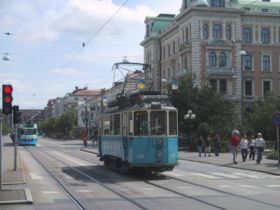 Gothenburg's popular trams travel the wide streets (the one shown in the foreground is a vintage tram used mostly by tourists). The main airport is located at Landvetter, 20 km east of Gothenburg. The smaller Gothenburg City Airport lies 14 km northwest of the city. 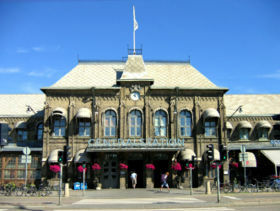 Other major transportation hubs are Centralstationen ("the Central Station") and the Nils Ericson Terminal with trains and buses to various destinations in Sweden, as well as connections to Oslo and Copenhagen. Several ferry lines run to/from Fredrikshavn, Kiel, Kristiansand and Newcastle. With over 150 km the Gothenburg tram is the largest tram/light rail network in Northern Europe. Gothenburg, as most Swedish metropolitan areas, has a large immigrant population. According to SCB in 2005, there are 93,965 immigrants resident in Gothenburg, which is about 20% of the population, out of which 10% is from Iran and 9% from Finland. The Iranian population, as well as other immigrants from the Middle East (notably Iraq) and former Yugoslavia, is concentrated in Angered (most notably Bergsjön, Hjällbo and Hammarkullen) and other suburbs in the north east. The Swedish Integration Board (Integrationsverket) have been critizising the city's lack of preventing segregation. By its naturally advantageous location, Gothenburg houses the largest and most important harbour installation in Scandinavia. Trade and shipping have always been important businesses and in the 18th century, the city was the home to the Swedish East India Company. 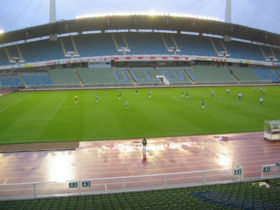 Industry developed into an important business, e.g., SKF, Volvo and Ericsson. The blue collar industries dominated until the late 1980s when shipyards started to shut down. Today the town has a mix of hi tech industries with Volvo Cars being the largest employer and a number of smaller computer software vendors. Gothenburg School of Economics and Commercial Law. There are two universities in Gothenburg: Gothenburg University and the Chalmers University of Technology. They were both initiated in the 19th century as university colleges on private donations. Today there are more than 60,000 students, which makes Gothenburg the largest university city in Scandinavia. There are also four folk high schools (Arbetarrörelsens Folkhögskola i Göteborg, Folkhögskolan i Angered, Göteborgs Folkhögskola and Kvinnofolkhögskolan). Gothenburg has some 25-30 gymnasiums. Some of more notable are Hvitfeldtska gymnasiet, founded in 1647, the Christian-oriented LM Engströms gymnasium, Göteborgs Högre Samskola, the art focused Schillerska Gymnasiet, and the Sigrid Rudebecks gymnasium, established in 1869. 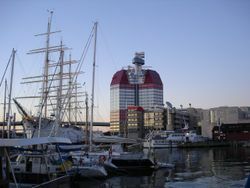 Göteborg has four twin towns and three sister cities. The cooperation with South African City of Port Elizabeth (established 1998) is a partnership fostering development of common fields of interest such as solid waste management, public libraries, sport and tourism. 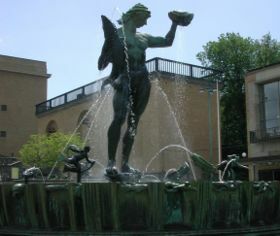 Poseidon by Carl Milles -- an often used symbol of Gothenburg. 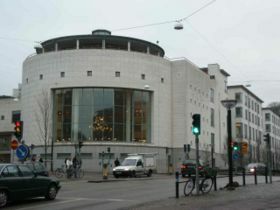 Gothenburg has a rich music life - the Gothenburg Symphony Orchestra is the best known when it comes to classical music. Bands like Soundtrack of Our Lives and Ace of Base are well known pop representatives of the city. 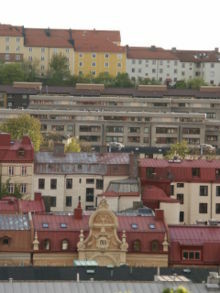 The city is also noted for being the centre of the melodic death metal movement (sometimes even called " The Gothenburg sound"), a typically Swedish musical style, being home to such internationally known bands as At The Gates, Dark Tranquillity, The Haunted, In Flames, Soilwork, and Arch Enemy. It is also a pop music centre in Sweden, with an active indie scene. There are many free theatre ensembles in the city, besides institutions like Gothenburg City Theatre, Backa Theatre (youth theatre) and Folkteatern. The Gothenburg Film Festival, held each year, is the biggest film festival in Scandinavia. Layers of architecture on Masthugget hill in Gothenburg; 19th century houses at the bottom, Brutalistic modernist houses in the middle and older Landshövdingehus at the top. Gothenburg, with its location just by the North Sea, has a number of top class fish and seafood restaurants. The city also has a number of star chefs – over the past decade seven of the Swedish Chef of the Year Awards have been won by Gothenburgers. The most popular place to buy the raw ingredient is the Feskekôrka ("Fish Church"); an indoor fish market, it got its name from the building's resemblance to a Gothic church. Four restaurants have presently (2006) a star in the Michelin Guide: 28 +, Basement, Fond and Sjömagasinet. Gothenburg is perhaps the city with the highest concentration of cafés and coffee shops in Sweden; with a large group of students in the city centre and a long tradition of more traditional cafés the number of establishments exploded in the 1990s. There are also a large number of pubs, bars and discotheques – for example at the main street Kungsportsavenyn. In the world of heavy metal, Gothenburg is considered the capital city of a certain melodic death metal style known as Gothenburg metal. Gothenburg metal is unique and distinct because of its very melodic and sometimes progressive guitar riffs and solos, and the clean singing that is incorporated (instead of just using the traditional death grunt vocals). Gothenburg's own At the Gates, In Flames, and Dark Tranquillity are credited with pioneering this melodic style. The Gothenburg metal has influenced numerous metal scenes across Europe and the rest of the world, including metal scenes in Finland, United States, and Canada. Its significance is one that cannot be denied and deserves recognition. Gothenburg has a wide selection of cultural establishments worth seeing. A new opera house was inaugurated in 1994, the Gothenburg Opera. Museums include art ( Gothenburg Museum of Art) and ( Göteborgs Konsthall), design and handcrafts (the Röhss Museum), sea history, natural history, science, East India, and the Museum of World Culture inaugurated in 2004. Kungsportsavenyn, commonly known as just Avenyn, "The Avenue", is the main boulevard. It was created in the 1860s and 1870s as a result of an international town planning competition. With a total length of about two kilometers, it stretches from the old moat at the edge of the older part of Gothenburg, and ends at the Götaplatsen square, where the Gothenburg Museum of Art and several other cultural institutions are located. Avenyn passes the Stora teatern, a Neo-Renaissance theatre and opera building from 1859, and has a major concentration of pubs, discoteques and restaurants. The Göteborg Botanical Garden is considered to be one of the most outstanding botanical gardens in Europe. Just across Dag Hammarskjöldsleden is Gothenburg's largest park, Slottskogen, where you can visit Gothenburg's Natural History Museum (Naturhistoriska Museet), a children's zoo (Barnens Zoo), and a family animal park (Djurgårdarna). The park is also home to the city's oldest observatory, but if you prefer, it's a perfect place for sun-bathing, picnicking, or taking a relaxing stroll through Gothenburg's shady forests. The amusement park Liseberg located in the central part of the city, is the largest in Scandinavia, and the most popular attraction in Sweden by number of visitors per year (>3 millions). Next to Liseberg is the science discovery centre Universeum. The central city and the harbour can be viewed from the The Gothenburg Lookout.